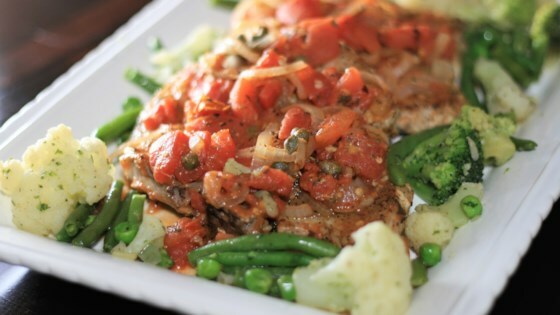 "These Italian-style pork chops include lots of onion, garlic, tomatoes, and savory herbs. This quick and easy recipe is a great topping for pasta or smashed potatoes." Heat a large heavy skillet over medium-high heat. Season pork chops with salt and black pepper on both sides and add to skillet. Brown pork chops, about 4 minutes per side. Transfer to a plate and cover with aluminum foil. Add onions and garlic to the hot skillet. Cook and stir until softened but still crisp, about 5 minutes. Add tomatoes, capers and liquid, rosemary, red pepper flakes, oregano, and basil. Bring sauce to a simmer and cook about 5 minutes to meld flavors. Pour any accumulated juices from the plate with the pork chops into the sauce in the skillet and stir. Add cooked pork chops and cover with sauce. Simmer until warmed through, about 5 minutes more. Very quick and easy, used 1 inch thick pork loin chops and added a good splash of dry vermouth. Served over crushed boiled redskin potatoes and steamed asparagus.